Dogs are amazing at recognizing their own names, but scientists are less certain about whether cats have this ability. New research from Sophia University in Tokyo, Japan offers new experimental data showing that some cats really can discern their names. The new research, published today in Scientific Advances, doesn’t mean cats understand the human conception of a name, but it does show that at least some cats can distinguish their names from other words. Prior research has shown that cats can recognize human gestures, facial expressions, and vocal cues. Atsuko Saito, the lead author of the new study, published a paper back in 2013 showing that cats are capable of recognizing their owners’ voices. These insights aside, researchers have only scratched the surface in terms of understanding the feline ability to communicate with humans—hence the uncertainty about cats being able to recognize their own names. The new study was an effort, therefore, to prove—and provide scientific evidence for—something cat owners have claimed all along. In a series of experiments, Saito observed 78 cats in Japanese households and at a cat café—a themed coffee shop in which multiple cats live in a shared environment. A critical aspect of study is a concept known as habituation. Basically, it’s when a psychological or emotional response wanes in intensity after repeated exposure to a stimulus. The raccoons in my neighborhood are a good example, as they’ve become “habituated” to my shouts and gesticulations when I catch them rummaging through my garbage; the raccoons have learned to simply tune me out. During the experiment, “if the cats were habituated to the other 4 words and dishabituated to their own names, a rebound response to the presentation of their own names would be observed, indicating the ability to discriminate their own names from other words,” wrote the researchers in the study. In other words, the cats were expected to get increasingly disinterested with each successive word spoken (i.e. successful habituation to stimuli) until that magical fifth word was reached—their name. Once the cat’s name was spoken, the researchers looked for five specific behavioral responses: ear moving, head moving, tail moving, vocalizing, and changing locations. A scoring method was used to assess how many, if any, of these behaviors a cat exhibited upon hearing its name; each behavior was given 0.5 points, for a maximum score of 2.5. The same scoring method was used during the trials when the four dummy words were being uttered to grade the habituation process. For the most part, the experiments showed that the cats were able to distinguish their own name, even when the name was said by a complete stranger. All cats were equally good at distinguishing their names from general nouns, but cats from the café were really bad at discerning their own name from the names of other café cats. Interestingly, cats living in ordinary households with several other cats were still able to discern their own names, so there’s something about the café environment that’s inhibiting the association (likely the sheer quantity of cats, and/or diminished opportunities for a cat to learn its name—but this needs to be studied further). Regardless, this is “the first experimental evidence showing cats’ ability to understand human verbal utterances,” wrote the authors. Mikel Delgado from the Department of Medicine and Epidemiology at UC Davis School of Veterinary Medicine said the paper was interesting, but she had some concerns, particularly with how the data was presented. Specifically, she didn’t like how the researchers only included the behaviors of the cats who showed full habituation to the general nouns or other cats’ names. This “cherry-picking” of the data, she said, made the findings look more profound than they really are. Delgado was also concerned about the behavioral scores and how they were interpreted by the authors. That said, Delgado liked how the researchers were careful to match the enunciation of each word, including the names, because “most of us when we call our cat’s names don’t do so in a monotone—we often use more of what is called ‘mother-ese’—a higher pitch that animals tend to respond to more,” she said. What’s more, Delgado wanted to know more about the cats who could discriminate their names, like if their names were simpler, or if the owners refrained from using nicknames. “It doesn’t mean that the cats understand that the word is a label for them—just that it is a sound that may predict food or cuddles or attention or something else,” Delgado told Gizmodo. “That is associative learning and of course all animals are capable of that. Some cats may be more sensitive to those cues, such as cats who really love food or going outside, and so on. 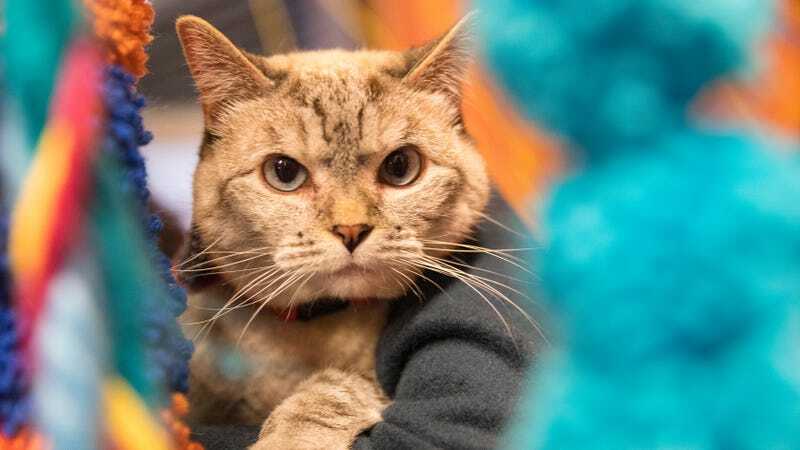 So it would be helpful in the future to try to tease apart some of the aspects of the cat’s personalities, lifestyles, or relationships with their humans that might make some cats more attentive to their environment,” she said.